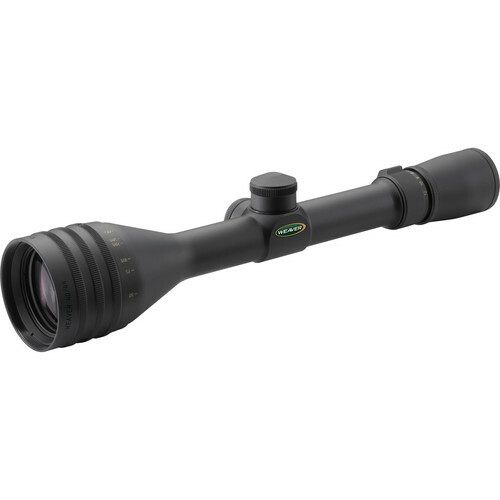 Designed for close to mid-range use, the matte back Weaver 4-12x44 40/44 Riflescope is outfitted with a wide and versatile zoom range, an objective with competent light gathering ability without being oversized, and fully multi-coated optics help to improve overall image brightness while boosting contrast and color fidelity. Its duplex crosshair reticle presents a simple and uncluttered aiming point for easy use at all distances. Windage and elevation adjustment turrets are capped to prevent dirt, dust, water, and grime from getting into the mechanism while also preventing accidental adjustments when moving through dense foliage. Its adjustable objective allows you to correct for parallax without the addition of another turret, which helps to limit the profile and overall weight. Made of a lightweight and durable aluminum alloy with a 1" one-piece main-tube, the scope's exterior has a matte back finish to protect it from corrosion and abrasion. Box Dimensions (LxWxH) 15.7 x 3.4 x 3.2"